I’ve whined about this before. Each time I use the web interface to acess my email account Firefox presents a Security Error: Domain Name Mismatch warning. The warning occurs because the secure URL I connect to is within my andrewlucking.com domain while the security certificate is issued to Dreamhost, my hosting provider. Now, technically Firefox is entirely correct in advising me of the issue. What irks me is that I have no way of storing the fact that I am aware of the mismatch and no longer need my browser to bring it to my attention each time I check my mail. Obviously the ideal way to avoid the warning is to correct the problem that is being identified – obtain a SSL certificate for my webmail domain. Realistically though the expense involved does not make it practical. So, after searching for a quick fix and reading through some mildly entertaining flame wars I did what one does in this day and age of the extensible web browser: I built a Firefox extension. 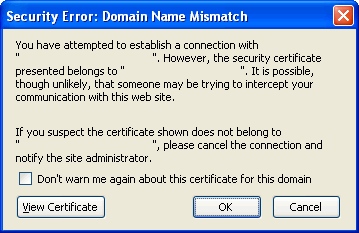 The Remember Mismatched Domains extension for Firefox adds a “Don’t warn me about this certificate for this domain again’ checkbox to the Domain Mismatch warning window. When selected the domain name and security certificate domain pair is stored in a Firefox preference and the security error dialogue will be bypassed on subsequent visits. In particular this entry from Nelson Bolyard struck me as particularly insightful. It’s a beta and could use some testing in different environments. The comments section would be a good place to let me know of any issues or drop me an email. update: just uploaded version 0.4. Details on the changes here. update: Now at version 0.5. Which adds support for Thunderbird. Details here. Hello, I would like to ask you how could I make my extension to disable domainMismatch dialog to appear. My extension goes to specific page and display stats, but I get that domainMismatch dialog. Could you suggest how to disable this thing in my extension? Grab the extension and take a peek if you like. Feel free to re-use anything in it that’ll help. Let me know if you need more details. Course another approach might be to run both extensions. thx for the fix! :) Made my day. Very useful! You should get it listed on addons.mozilla.org! DUDE I LOVE YOUR EXTENSION…. wow that can sound wrong! You have saved me so much time. Thank you! Glad ya find it useful Ben. any chance of making this extension work for regular mozilla mail (when I try to install it, I get a “Install script not found” error). Any chance of an update for Firefox 2? This looks like a great extension. I love this extension, we use it at work all the time!! (I work for a web-host, and its a common issue with Shared servers). Anyway, there is a bug with it in Thunderbird 2. It prevents me from sending any emails via a SSL SMTP port, 465 (if memory serves). I disable the extension and I can send emails with no issues. You truly made my evening here!! Got the same problem you discribed, and this fixes it nicely! Works great, even on OSX! This is great. I wish there was something like this for internet explorer, as well. Maybe that’s you! Having a look ahead to seee you. es handelt sich um ein sog.